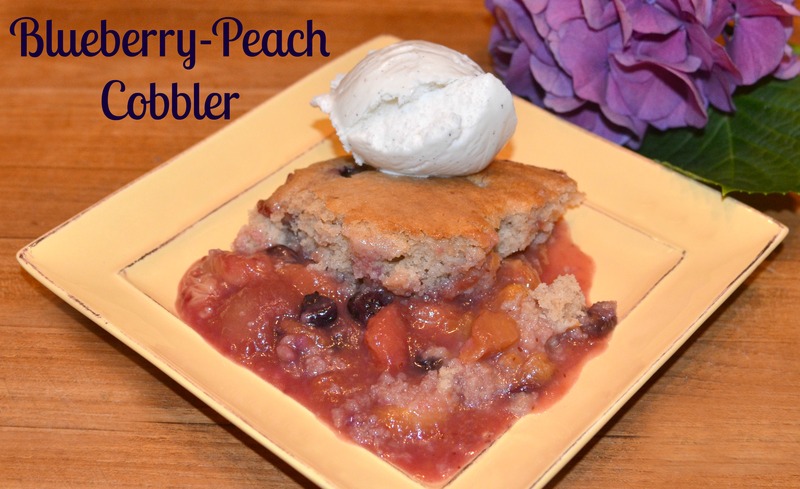 The peaches have arrived down here in the south and it’s time to make cobbler! This is such an easy dessert to make too. You can change it up by simply changing the fruits…make your very own version of this…it will be delicious!!! In a large saucepan, stir together the brown sugar and the cornstarch…then add the cold water. Mix until dissolved. Add the peaches and blueberries and cook over medium heat until thickened and bubbling. Add the butter and lemon juice and stir for another minute. Pour this mixture into an ungreased 2 quart square baking dish and set aside. In a medium-sized mixing bowl, stir together the flour, sugar and baking powder. Add the softened butter and mix until you see a coarse crumb mixture beginning to form. Add the milk and stir well. Mix in the Mexican vanilla, cinnamon and salt…mixing everything together. Spoon this mixture in mounds onto the peach and blueberry mixture in your baking dish and then smooth it all out as evenly as you can across the top of the dish. Place the baking dish on a baking pan (to catch any overflow of juices) and bake in a preheated 350 degree oven for 30-35 minutes or until bubbling and a toothpick inserted comes out clean. Serve with ice cream if desired. This is wonderful served hot…or cold the next day! Keep left-overs in the refrigerator, if you have any!